A big thank you to our Members, sponsors Honeywell, Jetstream Aviation and host facility Clay Lacy Aviation for providing this fun experience. PNBAA in conjunction with Aircare International is pleased to offer complimentary Inflight Medical Training exclusive to its members. Register online for either the morning or afternoon session (same content). Space is limited and first-come, first-serve with only 20 seats available per session. Preview: When faced with an inflight emergency, crewmembers preparedness is the key to a successful outcome. The Aircare Access intensive one-day training provides crewmembers basic first aid, CPR and AED skills; as well as instructing on the contents of medical kits (assessment and treatment tools). Unsure if your membership is current? Either log-on the website to review your individual profile or complete the Contact Us form for us to check it. New members join for just $50. It really feels like the best of summer when the Blue Angels are streaking overhead and we gather to enjoy a barbecue lunch with friends and family at Boeing Field. This year the organizing volunteers have turned the grill and shopping over to catering professionals, so everyone can enjoy a gourmet burger lunch and ice cream treat. Please register online at the event site for this FREE lunch in advance to support our catering plan. Also extend a big thank you to sponsors Honeywell, Jetstream Aviationand host facility Clay Lacy Aviation for providing this fun experience. Wow! Golfer registration sold out within days of the June 5th opening. We encourage anyone else interested in golfing to register now (joining the wait list). Inevitably there will be some openings due to the last minute conflicts of registered golfers. Good news - there are still sponsorship opportunities for any budget to consider. Plus they include golfers! VIP $5,000, Player Gift Certificate $3,000 and Raffle Prize Gifts $1,000. Luncheon tickets and volunteer opportunities are also fun options to participate. Have you noticed the flurry of news since late June on air traffic control (ATC) privatization? H.R.2997 – legislation containing provisions for privatizing ATC – a long-standing priority for the nation’s big airlines has been introduced. It puts general aviation's airspace and airport access at risk. Now it is time to individually voice opposition of ATC privatization and voice support of modernization. Your D.C. legislators look closely at the diversity of individual responses, not just the familiar industry advocates. NBAA has established a very quick way for you to share an informed perspective by contacting Congress with the link below. Every email counts, thank you. On June 7th, Raisbeck Aviation High School (RAHS) presented over 30 seniors with Scholarship Awards in excess of $500,000. The PNBAA Board was honored to participate on your behalf. President Jeff Roberts and Education/Internship Board Member Scott Jefvert presented three, $4,000 scholarship awards. The Board enjoyed a large pool of applications that included an essay on business aviation. 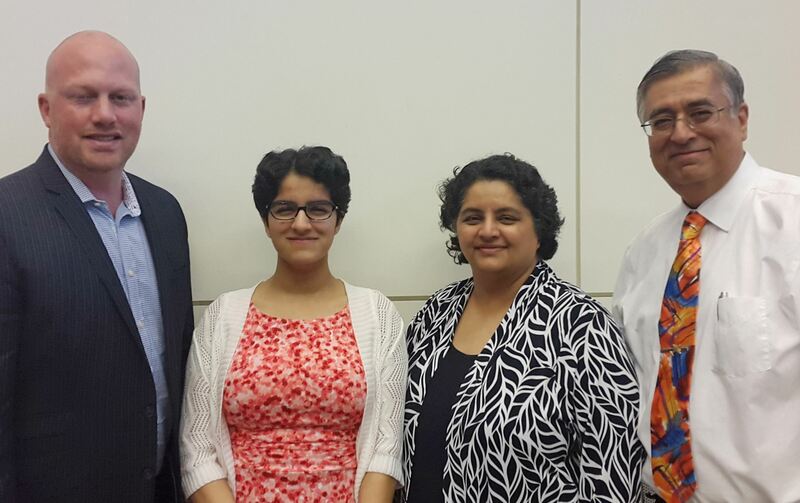 After review, the Board selected three outstanding individuals: Kalika Singh, Amber Thatcher and Michael Stemen. We wish them the very best in their college endeavors and career path in aviation! If you would like to consider engaging the bright minds of RAHS students for an internship in business aviation, please email Scott Jefvert. In early June PNBAA hosted the annual Schedulers & Dispatchers meeting in Seattle. It proved a great opportunity to develop relationships. The biggest news was announcing a $2,500 scholarship application opportunity for PNBAA members. Experienced and future Schedulers & Dispatchers are all encouraged to apply. Reference the PNBAA scholarship webpage to apply and note October 31st deadline. Board member Ernesta Corcoran joined everyone pictured expressing appreciation of appetizing food sponsor WithStyle Catering LLC and brand new facility hosts Signature Flight Support BFI. Make a plan to breakaway early next Thursday and register now for the 2017 annual Schedulers & Dispatchers meeting. You will hear George Comollo of Green River College present the process to obtain a Dispatch license, learn about a new PNBAA scholarship opportunity and strengthen relationships. Sponsorship opportunities are also still available. Thank you Signature Flight Support and With Style Catering LLC. 9th Annual PNBAA Charity Golf Tournament Sign-up! You have patiently waited. On June 5th golfer registration, available sponsorship packages, luncheon tickets and volunteer opportunities will all be available on the event site. Pro tip: Historically golfer and sponsorship packages sell out within 30 days. Last month many of the 2017 sponsorship packages were sold to the same 2016 sponsors who held a "right of first refusal" (ROFR) option. There remains great options for all budgets including the "Title Sponsor" package for the first time in 9 years! Save the date to be in Seattle. Your friends and family are invited to attend our free annual barbecue luncheon and watch the Blue Angels practice from Boeing Field. Additional details will be provided in next newsletter and on the event site. Would you like to volunteer on the organizing committee and engage the PNBAA community? Email board member Kimberly Perkins. PNBAA is one of 15 members of the Washington State Aviation Alliance (WSAA) represented by our board member Alan Burnett. At the end of April WSAA held its annual meeting and celebrated two wins this year! House Bill 1018 and House Bill 1400 were signed into law by Gov. Jay Inslee. HB 1018 increases the funding cap on a single state airport aid grant from $250,000 to $750,000. 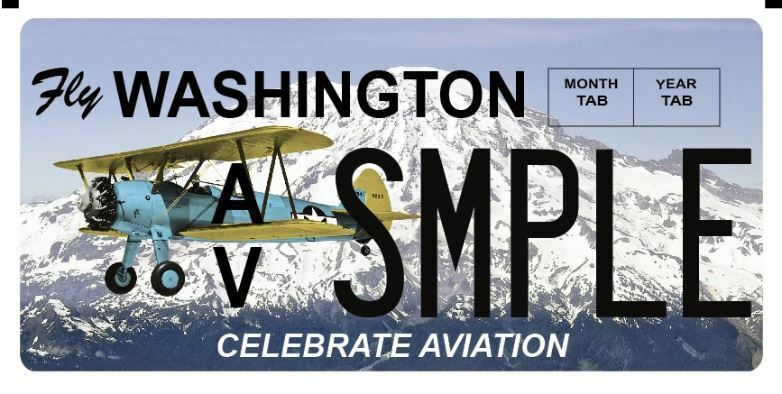 HB 1400 authorizes the first-ever Washington State Aviation specialty license plate. New plates should be available to order July 1. 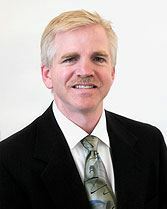 PNBAA extends our grateful appreciation to retiring WSDOT Aviation Director Tristan Atkins. For almost six years, Tristan has been instrumental in building relationships within the aviation community as part of the Washington State Aviation Alliance (WSAA) as well as contributing to the growth of the Washington Legislative Aviation Caucus in Olympia. Tristan and his staff have participated in multiple PNBAA events and he has consistently been a strong supporter of business aviation. Under Tristan's guidance, WSDOT Aviation and stakeholders around the state have celebrated multiple successes including the new aviation license plate and the passage of HB 1526, which reallocated aircraft excise tax funds to the state's aviation airport aid grant program. Please join PNBAA in expressing our sincere gratitude to Tristan Atkins and wishing him blue skies and tailwinds. On or before May 15, 2017 - This year, select 2017 sponsorship packages hold a "right of first refusal" (ROFR) option for the same 2016 sponsors. Reference the event site for details on how to exercise this option. If the ROFR option is not exercised by May 15, the package becomes available for anyone to request starting June 5, 2017. June 5, 2017 - Golfer registration will open. Sponsorship requests, luncheon tickets and volunteer opportunities will also be available on the event site. The golfer and sponsorship packages sell out each year within several weeks, so be sure to mark your calendars to sign up! 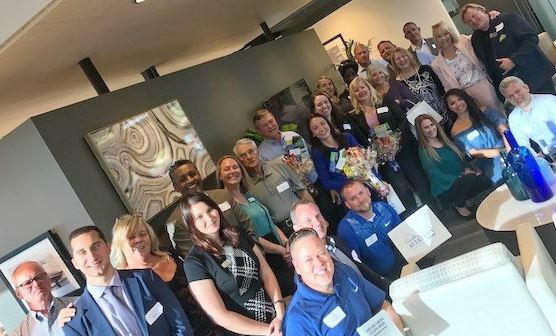 At the end of March regional corporate flight attendants and industry safety/service professionals gathered in Hillsboro to attend their annual PNBAA meeting. A highlight of the meeting was announcing the very first annual PNBAA Cabin Crew professional scholarship, $2,500. PNBAA Board of Director, Sara Culver-Truby was thrilled to name the recipient, Jennifer Meyers (pictured). Jennifer is currently working for Castle & Cooke Aviation in Everett, Washington as a Customer Service Representative. She plans on using the scholarship to attend Cabin Crew Initial training and start her career in the sky. Congratulations! The PNBAA Board of Directors is excited to announce the appointment of Kimberly Perkins as a Director filling a recent vacancy. Kimberly has been flying a Global Express and Gulfstream 650 out of Boeing Field since 2013. She holds a Master’s Degree in Political Science with a concentration in International Relations. Concurrent to aviating, she is an adjunct professor at Middle Georgia State University where she teaches International Airline Operations. Additionally, she is the Founder of Aviation for Humanity (www.aviationforhumanity.org), a non-profit that delivers school supplies to students in developing nations. Kimberly began her aviation career on the east coast where she received a Bachelor’s of Science degree in Aviation: Flight Operations. She followed the traditional path of becoming a flight instructor and then moved on to the airlines. She flew for Air Wisconsin based in Philadelphia, PA until her work took her overseas. Kimberly lived in Lagos, Nigeria for two years and Kuala Lumpur, Malaysia for one year. Those three years abroad, flying CRJs and Lear 60s throughout Africa and Asia, fueled her passion for humanitarian work and laid the foundation for what would become Aviation for Humanity. Kimberly returned to the United States in 2011 to take a position as a training Captain on a Lear 60. A few years later, she moved her family to the Pacific Northwest for a flying position out of Boeing Field in Seattle. In 2015, she was featured in the Women in Aviation magazine for her unique career path. Kimberly is a Seattle fanatic, an aviation enthusiast, and is dedicated to encouraging more women to enter the aviation industry. She is thrilled to become a PNBAA board member and looks forward to contributing to the success of business aviation throughout the Pacific Northwest! Have you noticed the browser search for PNBAA's website or associated links this year have included wildapricot.org in the domain? Not to worry, Wild Apricot is the web software PNBAA uses to administrate the website, membership, invoices and events. Early this year PNBAA changed domains to https://pnbaa.wildapricot.org to prevent new Google Chrome security warnings. The https:// designation and padlock icon identifies that the traffic to the server is encrypted - secure. Rest assured your PNBAA financial transactions have always been secure and now that protection extends throughout the entire website. Save the date! PNBAA will host an early evening meeting for Schedulers & Dispatchers in the Seattle area. The event website will be posted within a couple of weeks with all the details and sponsorship opportunities. 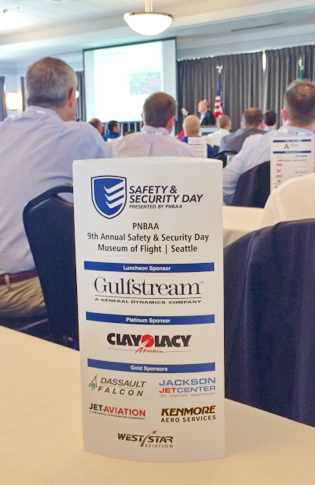 On April 6th the PNBAA community of 115+ attendees filled The Museum of Flight Skyline room to participate in the 9th annual Safety & Security Day. Attendees were in engaged from the moment the day started with the Civil Air Patrol Color Guard and The Boeing Employees Choir vocalists. Seven diverse programs followed covering: NBAA/Safety Committee, Fatigue, Leadership, Motivational, Drones and Personal Protection. A record 30 sponsors participated and invested in this program, including six first-time program sponsors**. Thank you on behalf of the PNBAA community. Alliant/John F. Throne & Co. Registration is OPEN for the annual PNBAA Flight Attendant meeting in Hillsboro. The event website has all the details. All CFA and industry professionals are encouraged to attend. Please register by March 22. CFA's - Do you need a food safety training certificate? Email Sara Culver-Truby to learn more about a March 23rd opportunity. Safety & Security Day is 5 weeks away - make a plan to attend! Attendee online registration and details are available on the event website. We anticipate another advance sell-out, register early. Motivational - Captain Charlie Plumb, Former Navy Pilot & Vietnam P.O.W. Would your company like to be an advocate on No Plane No Gain's new social media campaign, entitled “Business Aviation Works”? Select the following link #BizAvWorks to learn more. Last month NBAA celebrated 70 years with this 70 second video that is a great retrospective. The 9th annual Safety & Security Day is less than 60 days away. Attendee online registration is available on the event website. We anticipate another advance sell-out, so register early! The Organizing Committee is pleased to offer prospective sponsors a prospectus download and online payment on the event site. We are asking all sponsors to commit before February 28, 2017. Thank you to these early sponsor commitments! Save the date for the annual PNBAA Flight Attendant meeting in Hillsboro. Registration will be available on a PNBAA event website in about a week. PNBAA member registration is FREE; non-members $30. Last month the Board announced a vacancy and request all members consider applying for the position. The remaining term for this position is two years, through 2018. Please complete your application through this form link by February 10, 2017. Serving on this volunteer Board is a unique way to strengthen the Pacific Northwest aviation community and expand your professional experience. The Board composition is designed to be diverse group of business aircraft operators, service providers and manufacturers - representing all members. The time commitment varies with roles and interests. Plan on 2-4 hours a week. Everyone recognizes our individual business responsibilities continue to take priority. We encourage you to visit with any Board member to gain additional insight. This first ORAVI quarterly meeting of 2017 will focus on workforce development and will feature presentations on the new Oregon Manufacturing Innovation Center (OMIC) and STEM programs. Snacks and beverages will be provided and there will be plenty of time for networking. Contact Jake Jacobs at Oregon Aviation Industries at jake@oravi.org or 541.406.0711. The Port of Seattle is hosting a FREE workshop with NTSB Disaster Response specialists to guide anyone who may be involved in an accident response to support family needs. NTSB specialist and other professionals will present a variety of disaster response and family assistance topics. Through a series of presentations they will provide an overview of family assistance operations, applicable legislation, roles and responsibilities of responding agencies and best practices. Call for Board of Director Applications! The PNBAA Board of Directors has a vacancy and requests all members consider applying for the position. The remaining term for this position is two years, through 2018. Please complete your application through this form link by February 10, 2017. Thank you for considering this opportunity. We encourage you to visit with any Board member to gain additional insight. It is our hope announce the newest member in March. 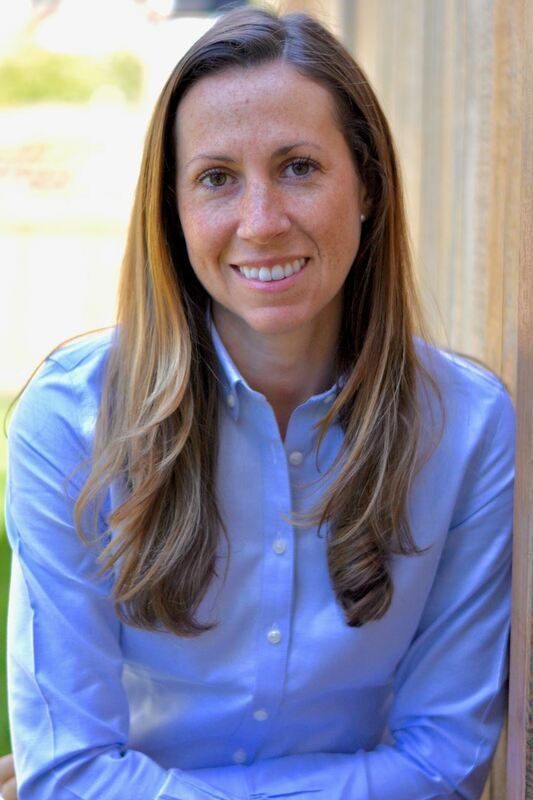 Ernesta Corcoran, Jetstream Aviation, Inc.
Wayne Werner, Jetstream Aviation, Inc. The 9th Annual Safety & Security Day is only three months away. The Organizing Committee is pleased today to offer a new sponsorship prospectus and preview of the program on the event website (reference homepage Upcoming Events). Please take a moment to review the prospectus and share your interest to participate within the next few weeks. Thank you for the consideration! The 2017 packages have evolved to create more benefits and engagement. The online payment page link will be revealed on January 24, 2017 to provide all sponsors an opportunity to consider the packages in limited quantities. All commitments are due by February 28, 2017. Attendee registration will open February 1, 2017 on the event website. One hundred PNBAA members and friends dodged the threat of snow to gather together one last time on December 8, 2016 at the Annual Member Meeting & Holiday Party. Board member Lance Robertson, Nordstrom received a special recognition with the NBAA Silk Scarf Award. This award recognizes his special contributions to PNBAA over many years. Lance is stepping down from the Board in January. The Board will back-fill the new vacancy with an open application process soon. Please consider this opportunity to participate in PNBAA's future success. Contact any Board member for additional insight on the role. NBAA news - The National Business Aviation Association (NBAA) has recognized 19 recipients of its inaugural Dr. Tony Kern Professionalism in Aviation Award, which honors individuals in the business aviation industry for outstanding professionalism and leadership in support of aviation safety. Frank Raymond of Vulcan, Inc. in Seattle is among the honorees - congratulations!